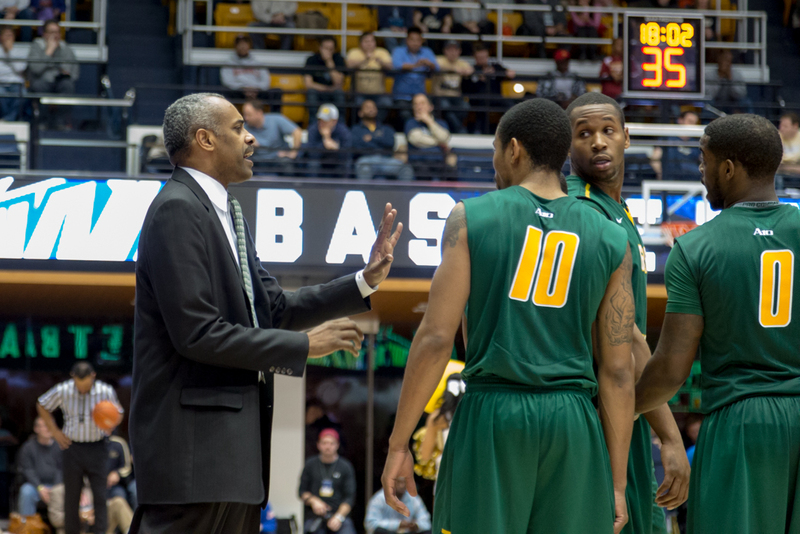 Hewitt has a quick chat with a trio of his players during a game vs. George Washington (photo by Maurice C. Jones). This is the struggles current NCAA men’s basketball and football players face on a daily basis. 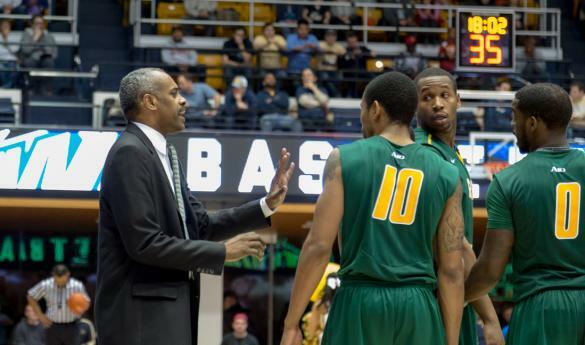 The masses want to remove their ‘student-athlete’ label and replace them with ‘fake’ and ‘not a real college student’ despite the fact, at least according to Mason men’s basketball coach Paul Hewitt, that they are not exposed to the interworking of intercollegiate sports and do not realize the balancing act they partake in every year. In 2005, the National Basketball Association created a rule that required those wanting access into the league at least one full year out of high school. Instead of focusing on the success of future Hall of Famers LeBron James, Kobe Bryant and Kevin Garnett, the failures of Kwame Brown, Jonathan Bender and Sebastian Telfair enabled the rule as a way to protect aspiring players that would be going up against men sometimes twice their age and far more advanced in body growth. Outside of Brandon Jennings, all top-notch American NBA draft hopefuls over the last nine years that perhaps want to make the jump straight to the NBA have played at the collegiate level for a singular season. This, in turn, has caused many to believe the college athletics system core of providing an elusive experience of education and competitive sport simultaneously is decaying and instead becoming a dumping ground for individuals who want to try their hand in the professional ranks but cannot. On Wednesday, Hewitt was a guest on ESPN’s “Mike and Mike” radio show and adamantly disagreed with the notion that the players don’t want to earn an education which was brought up by Jeff Van Gundy the day before. Of Hewitt’s current squad, only one player has experience outside of the American education system: sophomore Marko Gujanicic. Hailing from Serbia, Hewitt lamented the fact that his peers in the country envy Gujanicic’s opportunity to both get an education and play basketball. “He spoke up in the meeting, talking about how the system is so much better here than it is over there,” Hewitt said. “Because over there you practice six, seven hours a day and you don’t have a choice to pursue an education. One of the biggest detractors of the NCAA’s worth to young basketball players is Dallas Mavericks owner Mark Cuban, who said last week the NBA Developmental League is a better option. Hewitt, however, disagrees with that sentiment. “The Cuban thing really confused me,” Hewitt said. “The NBA one-and-done rule is something that was instituted by the NBA owners, so if Mark Cuban has a problem with that rule, he and the owners should get together and repel it. That’s not an NCAA rule. A lot of people are running around thinking the NCAA put that rule in. That’s number one. “Number two, 18-year-olds are going to act like 18-year olds. Over my years, I’ve had kids like Chris Bosh and Derrick Favors and Thaddeus Young and guys who have gone one-and-done, and those kids were model students at Georgia Tech. I can remember the last exam Chris Bosh took before he put his name in the draft was his calculus exam. The finger pointing at the NCAA, though, is not over nor will it be for quite some time.